Karnataka Chief Minister will honour Aishwarya Rai Bachchan, N R Narayan Murthy at the 2nd Vishwa Kannada Sammelan on March 11, 2011. Aishwarya Rai Bachchan will be honored for her contribution and achievement in the arts and culture segment in India and the World over. There were some speculation about Infy mentor whether he will make it to the event or not as currently he is in London and he has a program on the same dates which was planned two years in advance. But it seems he is not giving an ear to the protests and he will be in Belgaum on the 11th for the inaugural function. The city is getting a never ago like make over. All streets are being cleaned, walls painted, street lights being repaired, new dividers being built, walls have been built across a few places so that the visitors dont get to the bad side of the city. The district administration is working more than 24 hours and as the date is coming closer the work load is getting more. About 45000 delagates are expected to be here for the event which will have VVIPs, VIPs, Delegates classified into A, B, C & D categories. A,B & C will be VVIPs & VIP. All hotels, lodges, rest houses, schools, colleges, hostels, Wedding halls in a radius of 25kms have been kept aside for accommodation of these guests. Food arrangements are made at 7 locations with one location being kept for VIPs. This is for someone who do not know about these two personalities. Both Aishwarya Rai & N R Narayan Murthy got their first career break in the state of Maharastra. Aishwarya Rai grew up in Mumbai and received her first modelling assignment in Mumbai. 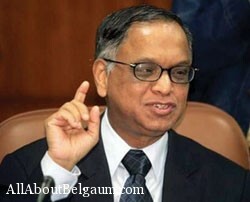 N R Narayan Murthy worked and started his own company in the city of Pune. First career break is something that a person never forgets in his entire life; its like your first love…. Aishwarya is doing wrong attending KVP,as still Belgaon is a Marathi city and has a staunch support of Shivsena ,Other hand she respects Thackrey's .It will create a New controversy in Mumbai. I respect all languages and wish good luck for KVP ,but still Belgaon is a Marathi city and changing Sign board for a week will change our Marathi culture ,which opportunist political leaders will not understand. Your Shivsena is having lot of internal problems, Shut up flip back a look Indian ancient history Marathas were also a sect of kannada, Lokamanya tilak had said this. Belagavi belongs to KArnataka and will. Your MES is Mess. your shivaseva nayaks are fighting. Belgaum is not a marathi CITY. IT BELONGS TO KARNATAKA AND NO SHIVSENA CAN CHANGE IT. I doubt if she knows kannada anymore and will she speak in kannada or Tulu? KVP should be most appropriately named "Karnataka Vishwa Parishat", thus involving all language residents of the State. There is always the next time. WHAT HAS GOT AISHWARYA TO DO WITH SAMELNA. WHAT HAS SHE DONE? THERE ARE MANY OTHER SOLDIERS WHO HAVE FOUGHT FOR OUR COUNTRY FROM KARNATAKA . What contribution has Ashiwarya done to Kannada..despite having her parents from Karnataka…Arent there any Kannada movie star who supported Kannada film industry ? Infosys should come to Tier II citties,where there is lot of potential,Govt.should give land to them near Hattargi SEZ.International standard infrastructure should be developed to decongest BANGALORE CITY.Belgaum and Hubli are the right choices. IT Park already exists at Desur (near International golf course), has roads, street lights, all the Infrastructure, but Companies yet to come in..